President Barack Obama is keeping all options on the table to help the Syrian opposition in its battle to oust the regime of Bashar al-Assad, including the possibility of implementing a no-fly zone, Obama's chief counterterrorism adviser said Wednesday. John Brennan, deputy national security adviser, said the administration already is providing support in various ways to the rebels, including humanitarian aid. Speaking at the Council on Foreign Relations in Washington, Brennan said the United States is looking at scenarios and making contingency plans as the situation evolves in Syria. "These are things that the United States government has been looking at very carefully, trying to understand the implications, trying to understand the advantages and disadvantages of this, and the president has kept us all quite busy making sure that we're able to do everything possible that's going to advance the interests of peace in Syria and not again going to do anything that is going to contribute to more violence," Brennan said. When asked if a no-fly zone was on the table of options, Brennan responded, "I don't recall the president ever saying that anything was off the table." Obama has signed a covert directive authorizing U.S. support for Syrian rebels battling al-Assad's forces, U.S. officials told CNN's Elise Labott last week. The secret order, referred to as an intelligence "finding," allows for clandestine support by the CIA and other agencies. The U.S. has ruled out lethal assistance and, to this point, has provided only nonlethal aid such as communications equipment. However a senior U.S. official recently told CNN's Barbara Starr the U.S. has increased its contacts with the rebels. The administration has come under fire from some members of Congress for taking what they say is a "hands-off approach" towards Syria. Sens. Lindsey Graham of South Carolina, John McCain of Arizona and Joseph Lieberman of Connecticut wrote in a recent Washington Post op-ed that the administration should immediately provide weapons, intelligence and training to the opposition. Furthermore, they said, "since the rebels have increasingly established de facto safe zones in parts of Syria, the United States should work with our allies to reinforce those areas, as Secretary of State Hillary Rodham Clinton suggested last week. This would not require any U.S. troops on the ground but could involve limited use of our airpower and other unique U.S. assets." Brennan is worried about al Qaeda taking advantage of the chaos in Syria to establish a presence as it has done in Iraq, Yemen and Somalia. But he is encouraged that the Syrians seem to be resisting the extremist mantra. 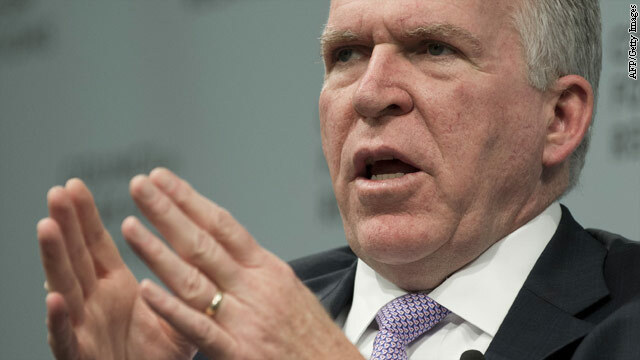 "The Syrian oppositionists have come out and have said that they're very concerned about the al Qaeda types and they have said that they are not going to sort of allow al Qaeda to take advantage of the situation there," said Brennan. The Kurds are a barometer now the majority are being trained in Iraq for if Assad falls to protect the Kurdish population from sectarian violence. I said to them you have been sold out that many times, it is your decision if you sit it out or help. So Obama's position is not really different from previous US decisions on uprisings, the Kurds in 91 being one example, indigenous populations from SEA that worked with the CIA another. So for the first part of the uprising the west position was for Assad to stay and he was given time to crush the uprising, the public position was PR, with little action behind it, Qatar, Saudi Arabia and Turkey were doing their own thing, which complicated the US position. And everyone knows you can't shame the Russians via violence so do nothing hope Assad survives (reason for the Syrian military staying intact, as recently stated by Panetta, bigger picture all of that), the Russians counter that by knowing the Syrians will start to hate the US and hold them responsible also and it will become radicalized. It is only when the reformer was proven to be a genocidal maniac, that people realized that position was not going to be viable but little has change. Big statements with no action behind them which is what Robert Fisk is always stating when giving assessments on Syria. Freedom is not free and if you want your freedom, you better understand how the geopolitical world works and plan around it, otherwise you will end up with no freedom and deceased. In 91 what happened to the Kurds, what was the alternative the outcome would have been what occurred in 2003 full invasion and occupation same time line, same outcome in blood and money. The bigger picture, so they got hammered and then a no fly zone and Clinton bombed Iraq. The basic question was it morally wrong on the simplest level yes, but on the most complex level it was moral. That is how the current position on Syria is justified, they want the military intact, if Assad had to stay then he did, even though Obama had said he must go, nothing was done to achieve that, it was PR. Unforgiving if you are a Kurd or a Syrian. You have to remember the western strategy was to keep the revolution unarmed and send them out every Friday to be massacred, knowing that no resolution would pass at the UNSC. Until they are all dead or compliant. But once again little understand of the Middle East, the Sunni's cannot allow a Shiite to massacre Sunni's and not provide some level of support, specifically the guardian of the two Holy Mosques and it is religion King or not, Malik awaits, it is responsibility from Allah. It was measured and moderate support not to escalate the situation, but the FSA was created indigenous by defectors and it militarized the uprising. We lost the Ronin weeks before and we held out for weeks after with only psy-ops anyone with credible HUMINT would have know that. But you still had to shoot Khattiya Sawasdipol and we found out Red Bull does not give you wings. well john brennan are you with or against me, barack loves iran that is why he can't addresse the syrian issue, syria is still at the top, there are other things more pressing like Homeland and I am not talkin about security. Despite its wealth and influence, the U.S. has little options in Syria. The Syrian people will decide the outcome of this conflict. So far, all the U.S. is doing is making things worse. I hope we don't come out with a new Afghanistan with all our weight placed behind Wahabi and Salafi extremists. Someone close to President Obama has a big mouth. I suggest that anything that has to do with Syria be kept secret. Secrecy is the best way to handle it. Find out who is giving out information freely and maybe the "bad guys" wont find out about it. as it involves Russia who 'allegedly' sent 3 naval vessels to their only overseas base in Syrian port of Tartus. Jordanian King also noted on how Assad may retreat to Alawite Sect and Tartus is part of Alawite sect. If the US and Europe doesn't help the rebels, and Assad stays in power, that only strengthens Iran's hand, helps not only to maintain a fascist state in Syria but helps the Iranian fascist government to stay in power and to promote its agenda. China is and Russia is again becoming a totalitarian dictatorship so of course they support someone like Assad and the Iranian government. Putin moves Russia everyday back to a Stalinist government who represses freedom of speech and ability to protest openly against the government without fear of arrest and prison time. The US and Europe can't sit back and allow Assad using Russian and probably Chinese weapons, Iranian Revolutionary guards to fight a proxy war against freedom of the people or allow terrorists to gain strategic advantage with the people of Syria fighting for their freedom, while. This is not what we stand for. To do that means taking out Syria's radar and antiaircraft systems as part of a no fly zone, no small task, or providing the Syrian people with the kinds of weapons they need to inflict heavy casualties upon the Syrian forces when they attack the people whether in the sky or on the ground. What all he "hawks" don't recognize is that even after more than a decade of being in Iraq an Afghanistan, our military still does not know how to "win" in these conflicts. It takes much more than just "shock and awe"! Sure, we can certainly deliver tremendous destruction very quicly, but this solves nothing. Why start yet another unwinnable war? We don't fight the war, but we help the liberators fight back by giving them to the means to do so. They represent the majority of the people of the country who want a democracy. If we don't, then there will be a much bigger problem in the future for the US, between Syria and Iran. Sounds like a "what if" analyisis. If we are capable of determining the future then why do we continue to struggle. One would think that we would choose an easy path. A fact of the matter is everyone has a different view point of what's going on, which means someone who actualy knows isn't saying anything or people are speculating. Liberators? What liberators? Iraq was better off under Saddam (not an endorsement). Today, they're an absolute mess, no thanks to us. It'll be on Obama's "table" till after the election. By then he'll be too late for those poor suffering people. But hey! after all O'B puts himself front back and centre every time! Maybe his "superpac" could buy him a spine? Everything is always "on the table." I think neither Assad nor the Iranian regime are deterred at all by these statements... It is time for an ultimatum. Lets start using more of whats on the table, because what is being used now is clearly not enough.